3. Scroll UP to Personalisation section in the next screen. 5. Scroll to and tap Dexterity and interaction. 6. Under Dexterity and interaction screen, scroll to and tap Interaction control. 7. Drag the slider right to turn Interaction control ON or enable it. 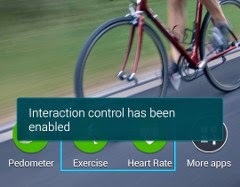 Interaction control is now enabled and ready for use on your device. 1. Press and hold the Home button and the Volume button down simultaneously while using any app. 2. In the next screen, adjust the size of the frame. You can also draw a line around the area you want to restrict. 4. You should then see the Restricted area you've recently set. This means that when you tap on the screen or press buttons like Home button, they won't work. 5. If you want to deactivate interaction control mode, just press and hold the Home button and the Volume button down simultaneously, then drag the slider to turn the feature OFF.